Living in an apartment, we have limited space for things like puppet theaters made from giant cardboard boxes. But even if you have a larger home you may not want a theater taking up a lot of floor space. Or you may want something easily moved from room to room. Never fear! If even I can make this table-top puppet theater, I have no doubt that you, too, possess the skills to do so. Gather your supplies: you will need a small cardboard box, string (word of warning: do not let 3 year old have a ball of string unsupervised. I’m just saying. ), scissors or x-acto knife, decorative paper napkin (it’s a little ghetto, I know, but it works), paint and brushes plus other do-dads you may want to stick on the box to make it shiny, duct tape. If you like you can use one of the box flaps and cut out a lovely architectural detail for the rooftop (lopsidedness is optional). Use duct tape to stick it on. I also reinforced the sides with tape because my box was coming apart. You may not need to do this. Paint and decorate the box. As you can see, the boys decided this would be a manly-man’s theatre. We painted with glitter glue, which is a great way to make something sparkly but without all the mess that comes with loose glitter. I also printed out an image of the comedy-tragedy masks for the roof peak. It’s really hard to see in the top photo, but they also have googly eyes. Hang the stage curtain. Attach a length of string inside the box with duct tape. Cut your paper napkin in two and drape halves over the string. The down side of the paper napkin is that it does not pull back easily unless the empty space on either side of the stage is wide enough to accomodate it. However, the upside is it is easy to install (no sewing! ), it doesn’t get in the way of the fun and you could simply remove it if it doesn’t work out. As you can see, we’re very relaxed with our crafty-ness around here. Gather or make your puppets. If you already have finger puppets, great! 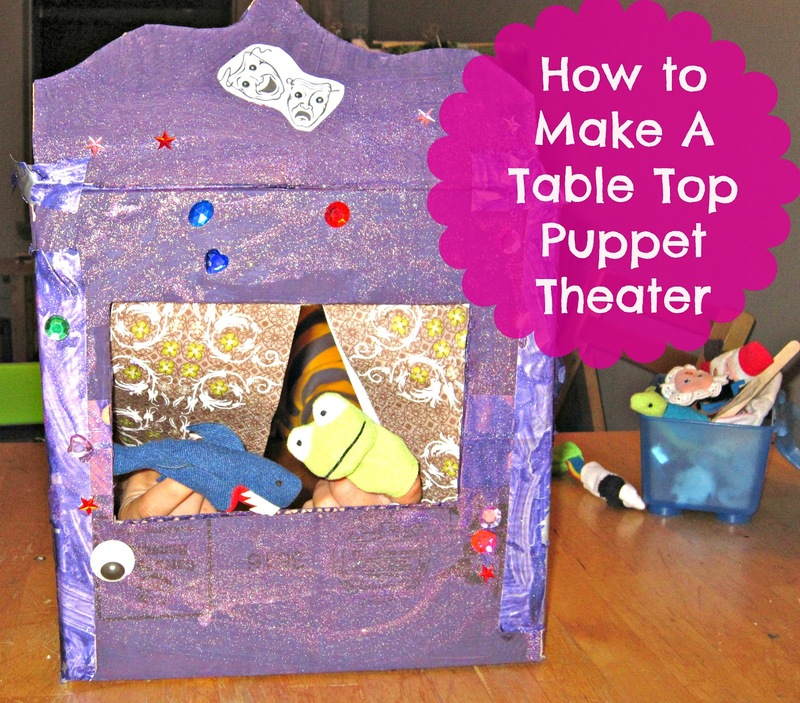 Use those, or if your kids are not yet burnt out with crafting, you can cut out images from magazines to make stick puppets like we did in this post. …or you can tape Hot Wheels on a stick…. It looks awesome, and I like the color theme 🙂 We also made a puppet theater like this in the past. I need to get it out one of these days and refresh the puppets. I love puppets! I also love that this is an upcycle project. Thanks. I was pretty happy that I was able to make it with things we already had. “I fail so you can learn.” Love it. I might have to borrow that one. You made me LOL today. I love this, and my favorite part is the Hot Wheels on a stick! 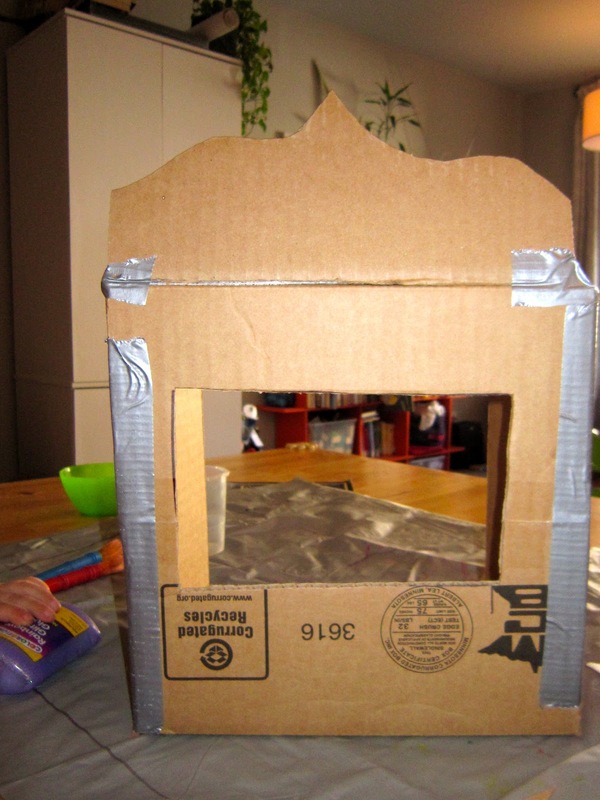 We recently made a puppet stage with a cardboard bread stick box. Great fun. However, we didn't think to tape a car to a stick, lovin' that and so will my little guy! It's really cute! I bet it's a lot of fun too. This is brilliant! I especially love the hot wheels on a stick. That is exactly what would happen at our place too. I've just shared this on The Weekly Kids' Co-op FB wall and I'll be featuring it on my blog tomorrow as one of my favorites from last week's link up. I love those spoon puppets that your made. Great idea!!! 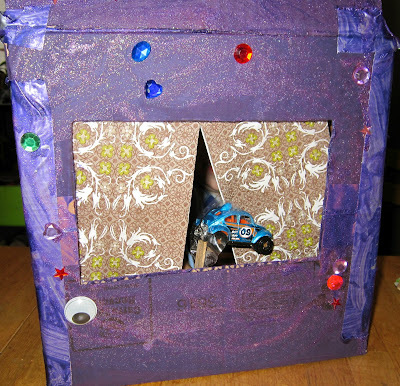 I love how the kids can participate in making the theater too! Thanks for sharing! They had a lot of fun with it.